The mark of a professional lies in the tools of her trade! Showcase all your mineral eye and cheek colors in our Glamour Tray Tote. Like a professional makeup artist you will be ready for guests at your glamour classes and to do your own color appointments. The tote comes complete with a carry handle and has a zippered front pocket for your demo applicators and other supplies. The padded tote holds two glamour trays. Tray #1 will hold all the Mineral Eye Colors and Tray #2 the Mineral Cheek Colors. Helpful hint: Cut out the colored pictures from pages 32 and 33 in the Look Book and tape them on the bottom side of the tray covers so you and your customers will easily know the names of each color! 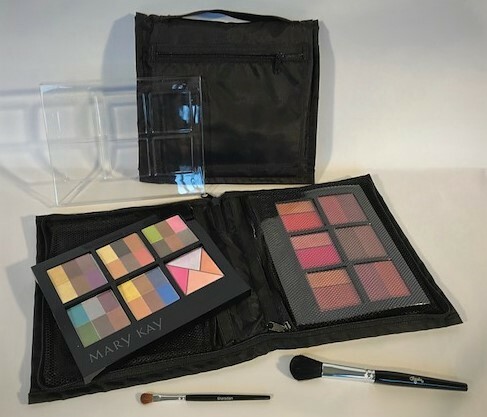 Note: The tote does not include the 2 Cosmetic Display Trays. They are ordered from Section 2 - #017364 $3 each.